Derek was born and raised in Monaco and discovered his passion for videography at a very young age through International traveling and producing short features with his school friends. The Arts have always been a focal point for him while growing up and earned his French Baccalaureate in Literature and Art History. After moving to the Washington DC area, he pursued his education at American University and earned his Bachelors degree in Visual Media and Cinema studies. Shortly after his undergrad studies, he started gaining more professional experience through various personal and collaborative projects in short features and documentaries both nationally and internationally. His style is both artistic and documentary based with a special affinity towards combining video with music to create specific emotions. In 2005 he discovered the world of social events and started developing the skill set to document weddings, mitzvahs, corporate events, stage performances and sporting events all while pursuing his interest in international documentaries for non-profit organizations and Universities in the DC area. He is currently based in Richmond, Virginia. 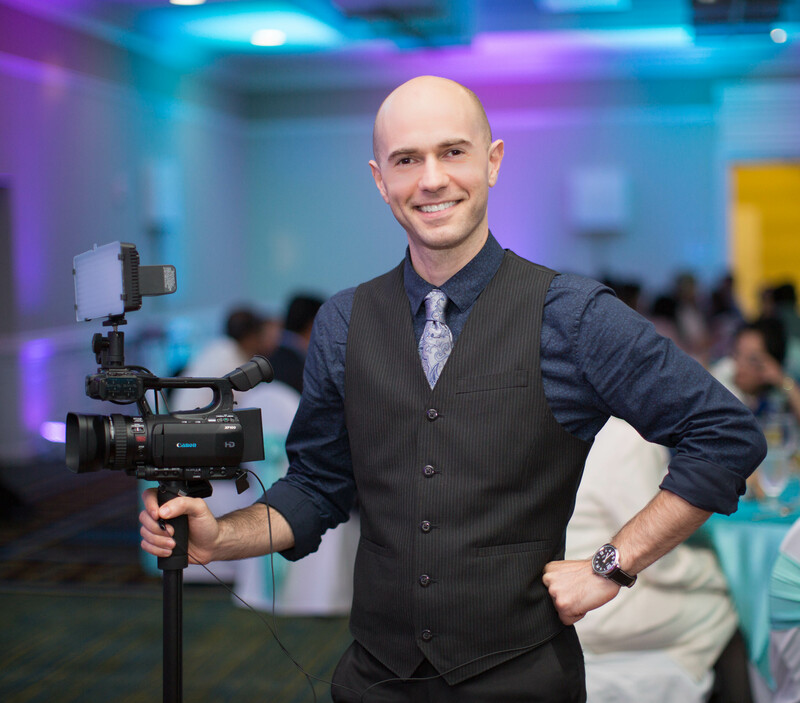 He has been filming weddings and other social events for many years now and his expertise is very high. He can work with a team or solo and adapt to any given situation. Improvisation and adapting are some of his best qualities along with being very unobtrusive. When Derek covers your event, you will be guaranteed full coverage of all the special and more candid moments. He has a sharp eye for detail. He believes in building a rapport with the client before their event to get as much information about them and to get an idea of the style of video they are looking for. You can be sure that Derek will always be in the thick of the action throughout your event, working closely with the entertainment, photographers and other vendors. Editing video is also in his skill set and he understands the importance of doing both shooting and editing in order to get the best final product to the client. Working towards capturing the memories of your special day is both an honor and a real joy for him because focusing on the memories of your life is his true talent!